The Jonas Brothers are back with Sucker, their new fun-meets-absurd music single, along with Priyanka Chopra, Danielle Jonas and Sophie Turner. Pop rock band the Jonas Brothers have officially reunited for the new song, Sucker. The three brothers -- Joe, Kevin and Nick -- shared the song on their band's official Twitter handle and its video also features the ladies of their lives. Sophie Turner, Joe's fiancee, Kevin's wife Danielle Deleasa and Priyanka Chopra prominently features in the video which has been shot in the UK. "#SuckerVideo is officially out! We really had the best time shooting this video in England with our family. Hope you guys love it. Feels good to be back," read the post of Jonas Brothers. Priyanka also shared the song on Twitter. 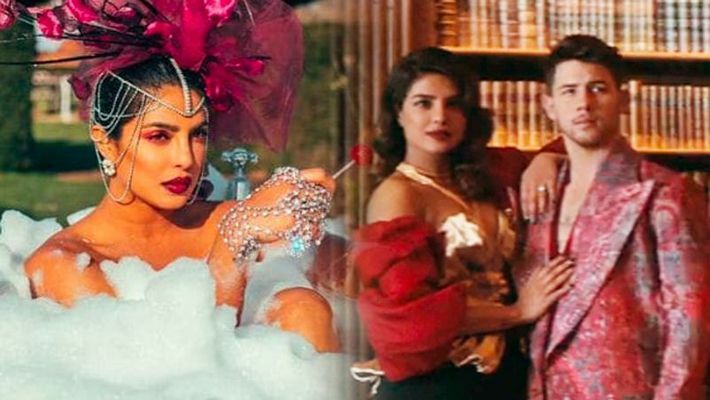 In one of the pictures, Priyanka can be seen soaking in a bathtub, wearing a headpiece with floral accents and jewellery and in the other, she hugs husband Nick Jonas. The third photo, in which the couple have been photographed from the back, appears to be taken after the pack-up. "#Sucker OUT NOW... This is the first time we've worked together but not for a moment did it feel like work. Such a fun family affair... #JonasBrothers and the #JSisters cheering each other on! Proud of you husband," she wrote. Recently, the brothers had teased about their reunion in a "Carpool Karaoke" spot for The Late Late Show with James Corden. The group famously disbanded in 2013 after cancelling their 19-date tour.